Out of nowhere, Daedalic decided to release a sequel to their most popular (and often divisive) point-and-click game series Deponia, announcing it just a week before release to the surprise of many. Those who played the original trilogy will know that it ended very definitively and was intended to be a trilogy with a clear beginning, middle and end. Similarly, the ending drew a bit of criticism and left fans hungry for more, so despite being an unexpected surprise, a sequel also makes perfect sense. With absolutely no information out there given the short-notice release and press embargo, this review will rely solely on my impressions of the game, which I am about halfway through (give or take a bit, probably take since the game claims to be around 20 hours long) given that we got a key from Games Republic yesterday. Needless to say, I have been trying to power through it to get as much information across on this article as possible. This will be spoiler-free for both Deponia Doomsday as well as the original trilogy, since some might still be intending on playing that. A good dose of nostalgia will please many. 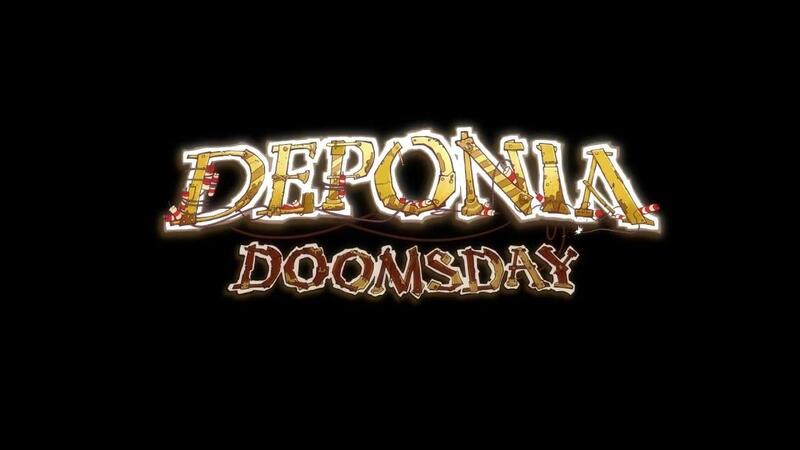 Deponia Doomsday takes place before, during and after the events of the original series. The story begins with a future vision of Deponia and then continues on with some events just prior to it. Those who played the trilogy will know that simply continuing on from where it left off would require some very convoluted twists and turns, so taking this approach seems to have been the right way to go, if not the only feasible one. In this sense, it’s hard to define the game as either a prequel or sequel, but I’ll refer to it as a sequel from now on since it shows clear intentions of changing the events which occur during and after Goodbye Deponia. The plot mostly centres around time travel and the changing of world lines which branch out from the previous story. So far so good, but this has the potential to either work very well, or just come across as a desperate way to squeeze in an unplanned sequel, which I’ll get to in a later. The game does quite a bit to strengthen the world and provide background and missing pieces on characters, places, events and even items which were used to solve puzzles in the other games. One thing which immediately jumped at me given the plot was the potential for massive amounts of dramatic irony, which would no doubt annoy pretty much everyone playing this who has played through the other games. However, this was quickly addressed and accompanied by a nice little quip about how this would have indeed been infuriating and the issue was subsequently put to rest. A good sequel or prequel often centres around striking a right balance between the new and familiar in key areas, as those who have had a chance to compare George Lucas’ prequels with J. J. Abrams’ sequel will know. Like Episode VII, the look and feel of the trilogy is thankfully preserved while providing enough new material to warrant a new game. That said, there is one new character which may or may not turn out to be a Jar Jar depending on how he is handled, but more on that in a bit. The familiarity works well and the return of items such as power inverters will no doubt delight many. Conversely, though the plot does centre around the goings on of the other games, it’s all new and fresh and even the old locations are different, shown from new angles with previously inaccessible areas now open. I also get the feeling that there may well be multiple endings from what has been shown thus far, a suspicion given further credence by a couple of the achievements. Don’t quote me on that though as it may turn out to be completely wrong. Familiar yet not so familiar locations. To begin with, there were some nice surprises. I was impressed by a mysterious figure doing an excellent David Hayter impression, which after looking at the credits turns out to be the man himself doing a humorous cameo. These kinds of pop culture references make more of an appearance in this game than in its predecessors, though they’re often quite subtle and not too in-your-face. Similarly, old locations are revisited (with new art) and some nice backstory and references to the old games are provided in a nice wink to the fans. For example, in one part you discover how Lotti (the receptionist at the mayor’s office) came to be. Similarly not too in-your-face is Rufus, who has been toned down somewhat. The series protagonist had a bit of a marmite effect on many, and presumably this has been done to address that. While the character obviously hasn’t been re-written since that would draw a lot of negative feedback, there is a clear lack of the sequences where the player was forced against their will to do something completely moronic that would end in utter devastation. These were pretty good gags and do make an occasional appearance, but they’re not the type which make the player want to pull their hair out like with the cartridge cleaning or hammer-fetching sequences of the old games. The humour has also shifted away from Rufus somewhat, not relying on his antics so much for the laughs. So far, there have been a few of points in the game where I have laughed out loud and having coincidentally been replaying the originals just prior to the release of this game, I can say with certainty that the new game has been funnier. This is all, of course, dependent on taste but I think there’s enough variety to please everyone. Likewise, the puzzles are more streamlined. As a rule of thumb in point-and-click games, I tend to define a good puzzle as one where the solution seems obvious once it’s completed. While in the 7 hours or so I’ve been playing, I have been stuck a couple of times, but was left kicking myself afterwards for not having seen such an obvious solution. This is a welcome departure from the original games, where solutions often had to be stumbled into. McChronicle being a bit of a third wheel. The jury is still out on these things, since as the story progresses they may be resolved, mitigated or used advantageously, but they’re worth mentioning as things which may potentially turn out to be drawbacks or even make or break issues. These should obviously be taken with a pinch of salt and as potential issues which at this point concern me not having completed the whole game. They could turn out to be major issues, or not issues at all. - The original trilogy was designed to be a trilogy and had a very clear ending which has put the developers in a deus ex machina situation. In this case, the time travel card has been used. So far it hasn’t felt forced, but there have been references to players “not liking the ending” so it could be interpreted as an entire game whose sole purpose is to change something players didn’t like. - There is a time-travelling character whose reason for being there is completely unexplained with no backstory provided. He’s completely central to the plot despite being plonked there and seems to be present throughout the game and thus far feels like excess baggage since Rufus is not the type to have a sidekick. This could be easily amended in the later game if there is some sort of revelation or actions taken to endear the character to the audience, or not. - Time travel can be pretty concerning in a plot if not done right and considering the developers already wrote themselves into a corner with the last game, there’s potential for that to happen again albeit unintentionally this time. So far so good, but there’s always the possibility of things getting out of hand. - How the ending of the game is handled will determine if it comes across as some much-needed closure, something that paves the way for more games or simply a needless addition which capitalises on the popularity of the original games like may film sequels these days. - If the game does end up coming across as pointless, then the pop culture references will be seen as needless time travel-related fanservice. When the inevitable reunion with Doc comes about, a line like “that’s heavy, Doc” would be more facepalm-inducing than humorous. Also, a high-five for me if I predicted the presence of that line. - There are quite a few new characters, possibly too many to really become endeared to since all the jumping around means limited and superficial exposure to the ones which aren’t as periphery. I might do a retrospective review after completion, or just update on here and answer questions to address these things. Most of these concerns are centred directly and indirectly around how time travel is used as a plot mechanic, so if you absolutely love time travel in stories then it may not be an issue for you. I just really hope it continues to be used well throughout and not just as a lazy gimmick used to travel to new locations or fill in plot holes. One of the unimaginative minigames. The thing which immediately struck me as a negative almost as soon as the game started is the presence of a few quicktime-esque events and sequences which involve clicking repeatedly as fast as possible. While there seems to be no tablet port as of yet, to me this comes across as an attempt to pander to those audiences which flock to their glowing rectangles like flies to light bulbs for when the time comes to please the masses and do a port. Tapping on a piece of glass until something happens isn’t gameplay, and while this may not have been a cynical design choice as I have interpreted, the association to the inevitable dumbing-down of culture is there. This is less heavy as the game goes on, but in a genre known for clever and memorable minigames like Monkey Island’s insult sword fighting, every time they’re encountered, it feels like a missed opportunity for something more clever. The music (so far) has been weaker than in the old games. There’s a return of some familiar and nostalgia-inducing tracks, but the new rendition of the main theme for example feels watered-down. Poki has been far less present, and though it may have been a bit forced to have him there as frequently as in the other games, his sole appearance thus far was also rather watered-down. This next issue has only occurred to me once, and perhaps a warning on here may prevent it from happening to others. In the game, there is a time travel device which allows you to turn back time at will rather than when it is time for the story to progress. Unless you save obsessively, this may result in you annoyingly losing quite a bit of progress and having to repeat things. The ability to be able to do this at will seems extremely pointless since at no point is there anything you can do wrong and need to correct and there is no need to do so except for moments when it’s completely obvious that it’s required. Inevitably, this will lead players who are stuck to try the only thing they haven’t tried and then get even more frustrated and even ragequit. That’s a very simple oversight which a warning box or simply not giving this ability could have solved, but then once the player does it they are unlikely to do it again. Honestly, at this point in the story it has potential to go either way. Deponia fans will most likely pick it up regardless and take a leap of faith, but those on the fence about the original trilogy will be those who need to be won over into buying it. So far, certain decisions have indicated that the developers know what they’re doing and are aware of what audiences think. While I have cited a few reasons for potential concern, I’m going to go out on a limb and say that it’s more likely than not that Daedalic have this one in the bag, especially considering how aware the writers seemed to be about the issue of dramatic irony and how early it was nipped in the bud. At the same time, obviously as a pretty big fan of Deponia, I put pretty much everything under a scrutinising lens for this game, perhaps more than most would. If you have less of an attachment to the series and simply enjoyed it as a solid adventure game and are looking for more of that, then there’s no reason why you shouldn’t pick this up since it no doubt provides that. Aside from a few fairly minor nitpicks highlighted above, I have enjoyed every moment of the game thus far. It feels very well put together, the puzzles and humour hit the mark and it’s been great revisiting familiar locations and characters. Having just recently played The Complete Journey, I can safely say that I have enjoyed this game more thus far, mostly for the aforementioned puzzle and humour improvements. That said, the overall experience could either turn out to be excellent or mediocre depending solely on the story since the other aspects are all very much in check. If you need that extra reassurement, then I’ll try get some more conclusive thoughts on it once I complete it in the next couple of days. Otherwise, you can pick up the game and The Complete Journey (if you don't have it already) over at Games Republic on the GOL storepage. Update: it seems that the game has received positive scores from critics, so some of the concerns expressed here may not apply. Some were hard, but I've played tougher P&C games, especially some of the older ones where there weren't things like hotspot indicators. Segata Sanshiro Some were hard, but I've played tougher P&amp;C games, especially some of the older ones where there weren't things like hotspot indicators. The one where Rufus forgot the password due to the noise was totally unfair and IMHO the worst puzzle I ever met in about 30 years of adventure gaming (including goats). The rest was fine with me. Segata Sanshiro Some were hard, but I've played tougher P&amp;amp;C games, especially some of the older ones where there weren't things like hotspot indicators. Totally agree, that was the only part I has to find a walk-through to solve, so much bad language after I saw the solution. Other than that though great games. Will purchase as soon as a DRM free version surfaces. The most horrible puzzles I remember are the tunnel explosions (didn’t make any sense) and the pigeons/cats (IIRC one part of it was impossible to understand due to the bad translation). Eike The one where Rufus forgot the password due to the noise was totally unfair and IMHO the worst puzzle I ever met in about 30 years of adventure gaming (including goats). The rest was fine with me. I saw that as quite a clever break of the fourth wall really. Kind of similar to the "back of the package" thing in the original MGS. Breaking the fourth wall is ok, funny somtimes, though I feel Poki overdoes it - but it shouldn't be (secret) part of a puzzle. BTW, of Metal Gear, I only played the original Metal Gear 1 and 2 on my MSX back then.